A giant gold ribbon has been unveiled at King’s Cross Station, London, by the charity CLIC Sargent in support of Childhood Cancer Awareness Month. The ribbon was unveiled by eight-year-old Zainabou Adams from Essex, who was diagnosed with Hodgkin’s lymphoma in July 2013 and underwent chemotherapy. She is now in remission. She was joined at the unveiling by mum Laila, sister Ndey and their CLIC Sargent social worker Samantha Fern, who is based at UCLH. CLIC Sargent is urging people to wear a gold ribbon for Childhood Cancer Awareness Month throughout September, and to show their support for families coping with childhood cancer. Every day, about 10 children and young people in the UK are diagnosed with cancer. Treatment normally starts immediately, is often given many miles from home and can last for up to three years. Although the survival rate is more than 80%, cancer remains the single largest cause of death from disease in children and young people in the UK. CLIC Sargent’s director of fundraising, Lucy Caldicott, said “Every month, thousands of families deal with the devastating impact of a cancer diagnosis and its treatment and CLIC Sargent is here to provide vital practical, emotional and financial support. 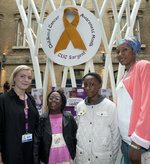 Childhood Cancer Awareness Month is supported by Network Rail.